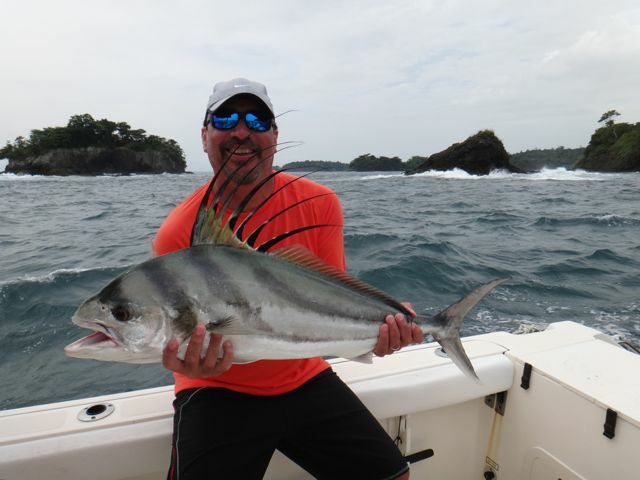 The 2013 “Peak Season” is over in Panama, but the rainy season hasn’t put any dampers on the great bottom fishing that we normally have during this time of the year. 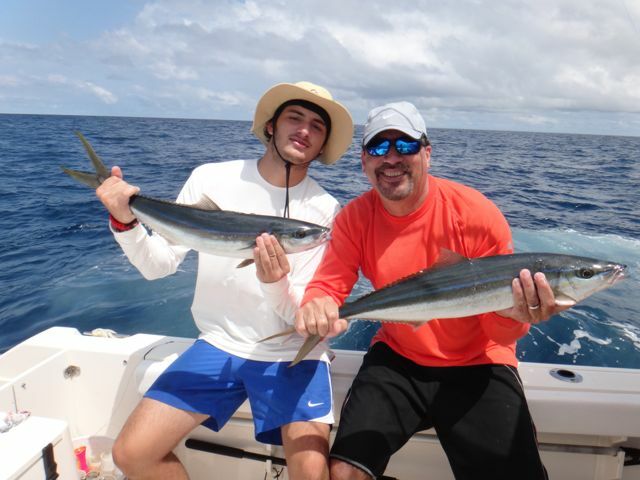 Fishing with us this week were Edgardo C. Sr. from San Juan, Puerto Rico along with his son Edgardo C. Jr. “Junior” who flew in from San Francisco, California where he is attending Pacific University and playing Volleyball for the Pacific Tigers. The blue, crystal-clear water continues to be just a few miles offshore from the lodge along with 2-4 foot swells. A cloud cover brought some relief from the Tropical sun. We have been fortunate that the rain has not arrived in full force, but I’m sure it’s not far away. Pacific Humpback whales continue to perform only 10 minutes away from dock! What a sight these majestic animals provide. We are so blessed to have such a rich marine environment in the Gulf of Chiriquí. The bottom bite continues to be hot, and this father and son team wanted to experience as much action as possible. We decided to troll during the morning hours during the low tide, and in doing so, caught a total of 16 Oriental Bonitos. Besides being great table fare, these miniature torpedoes will keep you busy once the bite is on. We then headed over to one of my favorite locations for bottom fishing and as expected, the Snappers were home. Although we experienced some cut offs along the sharp rocks, Sr. and Jr. had a blast playing tug of war with Mullet Snapper as well as a rare Silk Snapper and numerous Rainbow Runners. 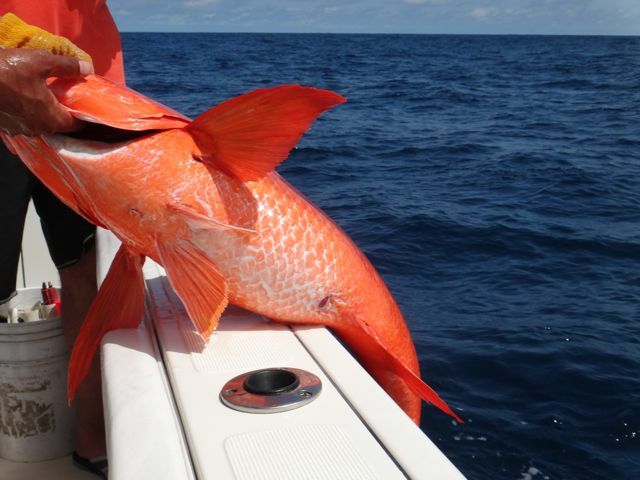 These Mullet Snapper are very powerful fish so the angler must be ready at all times in order to be successful. I tip my hat to the excellent job our two anglers did in boating as many fish as they did. On day two, we started the day slamming the bottom dwellers once again. We then moved to another location to try our luck with Roosterfish to change things up a bit. After approximately 20 minutes, we had Edgardo Sr. hooked up to a nice Rooster which he boated for a few photos and then a live released. 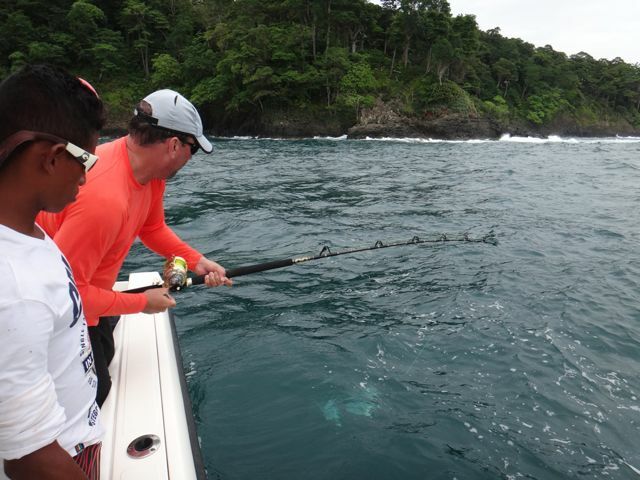 Just prior to heading back to the lodge, we had a second Roosterfish on, and this time Edgardo Jr. was on the fight. Unfortunately, the fish spit the hook. 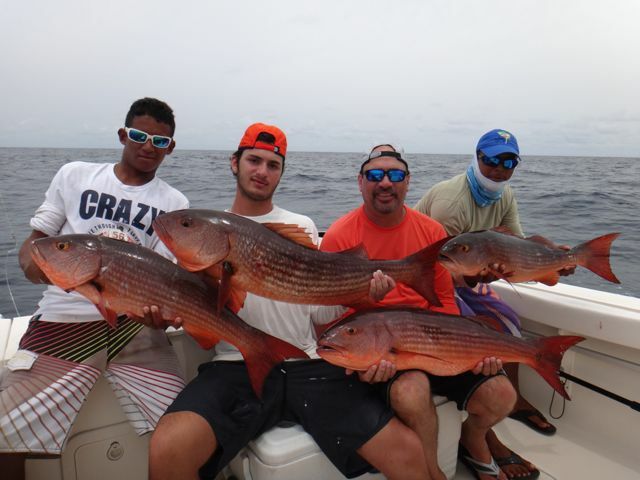 As always, we would like to thank Edgardo Sr. and Jr. for giving us an opportunity to take them fishing. We look forward to seeing them in May 2014 for some Yellowfin Tuna action. We wish them both well and the best of luck to Edgardo Jr. and his volleyball team. Go Tigers! Edgardo’s Sr. big Mullet Snapper!!! Edgardo Jr another bent rod! !